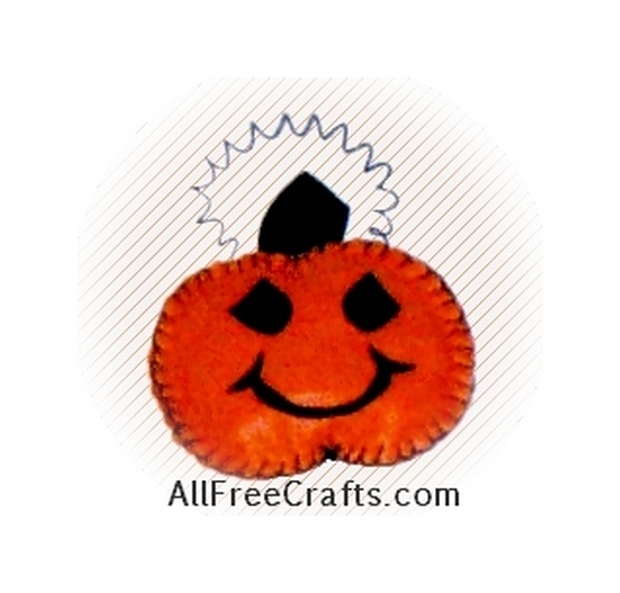 Make these little felt pumpkins as ornaments for Halloween baskets or fall table settings. Cut two circles of orange felt. Cut shapes from black felt to use for the eyes, mouth and stem. Glue eyes and mouth in place on orange circle. Stitch the two circles together with black floss, stitching in the top stem between the two pieces of orange felt as you go. Add a few extra tight stitches at the bottom centre to pucker the felt slightly and do the same at the top center. Just before you finish sewing completely around, stuff a small amount of fabric scraps into the center and then finish stitching closed. Take a piece of wire and wind around a pencil to form a coil. Add a dab of glue to each end of the wire and push in between the two pieces of orange felt; press with your fingers to secure and allow the glue to dry completely. You can re-inforce this with a few extra stitches around the wire. Copyright © 2008-2014 Susan Spatone All rights reserved.